You have the opportunity to practice as an instructor of Jumple, a discipline is growth and in great demand. 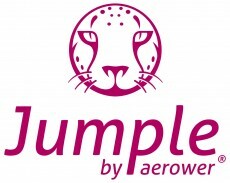 The innovative features of this program, the benefits of bounce and jump exercise coupled with the safety and quality of Aerower jumpers make up the perfect formula to make fitness classes more fun, productive and motivating your gym, club or similar. THAT I HAVE TO DO? Then select the course you want to enroll in and fill in the form that appears. Do not forget to provide the documentation that you request. We will review all the information and will contact you in case you need anything else or to comment on anything. If everything is correct you will receive an email with the steps to follow to make the payment and to download the material available. If you do not find a course that fits you well by dates or location, click the "REQUEST ANOTHER COURSE" button that you will see at the end and, when you have filled out the form, we will contact you to find a solution. Do you want to join a course? Fecha: 18 y 19 de Mayo.